On June 7, I posted a letter to the President of the State Board of Education from a former Latin teacher in the Roanoke County system alleging cheating at one or more schools in that system. That teacher, Robert Maronic, averred “widespread” cheating and claimed to have informed the administration of the problem in November, 2012, the Board of Supervisors in October, 2015, and the School Board in November, 2015. 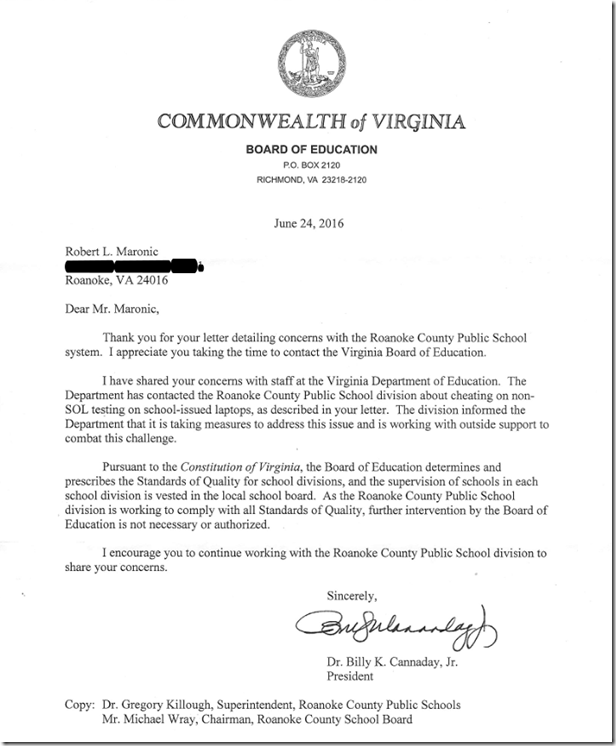 On June 24, Maronic received a reply (reproduced below) from the President of the Board of Education. Let’s analyze that letter. 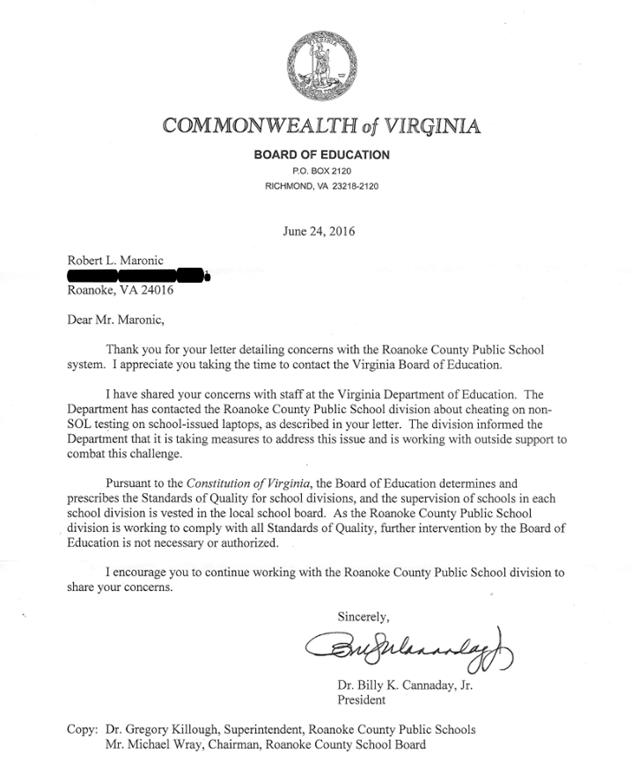 Thank you for your letter detailing concerns with the Roanoke County Public School system. I appreciate you [sic] taking the time to contact the Virginia Board of Education. The [Roanoke County Public School] division informed the Department that it is taking measures to address this issue and is working with outside support to combat this challenge. Those measures will “address,” but perhaps not eliminate the cheating. What this does not say is that the Roanoke County School Superintendent has eliminated the cheating and fired the people responsible for it. Pursuant to the Constitution of Virginia, the Board of Education determines and prescribes the Standards of Quality for school divisions, and the supervision of schools in each school division is vested in the local school board. Va. Const. art. VIII, § 4: The general supervision of the public school system shall be vested in a Board of Education . . .
Va. Code § 22.1-65: A division superintendent may be assessed a reasonable fine, suspended from office for a limited period or removed from office by either the Board of Education, upon recommendation of the Superintendent of Public Instruction or the school board of the division for sufficient cause. We need not parse the scope of “general supervision” to understand that the Roanoke County Superintendent is responsible for what happens in his system. Either he knew of the cheating and needs to be fired for not dealing with it, or he did not know of the cheating so he needs to be fired for incompetence. And Cannaday is President of one of the two Boards that can do the firing. As the Roanoke County Public School division is working to comply with all Standards of Quality, further intervention by the Board of Education is not necessary or authorized. “Working to comply” has a nice, bureaucratic ring to it. Unfortunately it is content neutral as to the real issues: What, exactly, was the extent of the cheating? Who was responsible for allowing it? Have all those people been fired? What steps has the Superintendent taken to assure the public that the cheating is stopped and will not be restarted? As to further intervention (Huh? Where was the first intervention?) not being authorized, we have the President of the Board of Education that can fire the local Superintendent uttering a bald lie. Dr. Billy K. Cannaday, Jr.
Did you get that, peasant? You’re dealing with DOCTOR Cannaday, not some uncredentialed bureaucrat. More to the point, DOCTOR Cannaday’s degree is in educational administration. If DOCTOR Cannaday had paid attention while acquiring that degree, Va. Tech would have taught him that hiding behind a misstatement of the law, in preference to doing his job, is not something a competent educational administrator would do. If I may step back from the snark for a moment: This letter is written in what Peggy Noonan calls the “horrible bureaucratic nonlanguage people in government revert to when they don’t want to be understood.” Entirely aside from the shocking misstatement of the law and the appalling refusal to deal with a cheating scandal, the letter sends the message that our education establishment cannot (or will not) write clearly and in good English (I trust you caught the absence of the plural with the gerund in the second sentence). For sure, Cannaday did not draft this awful document; some bureaucrat in VDOE wrote it in the Mother Tongue of the bureaucracy. But Cannaday signed the thing and, thus, is stained by it. I used to hold VDOE and VBOE in high regard. Looks like I am a slow learner. PS: I have asked VBOE for the documents that underlie this scandal. Stay tuned.